Most people would then say that as long as P2 is less than P1 we have proved the case. But there is uncertainty in both P1 and P2 and this will be translated into uncertainty in the estimate of their difference. We strictly need to show not only that the difference (P1 – P2) is positive, but that the difference exceeds the uncertainty in its calculation. Here’s how we can do that. 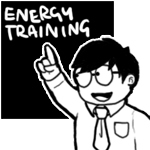 In the example which follows I will use a particular form of EnPI called the ‘Energy Performance Coefficient’ (EnPC), although any numerical indicator could be used. 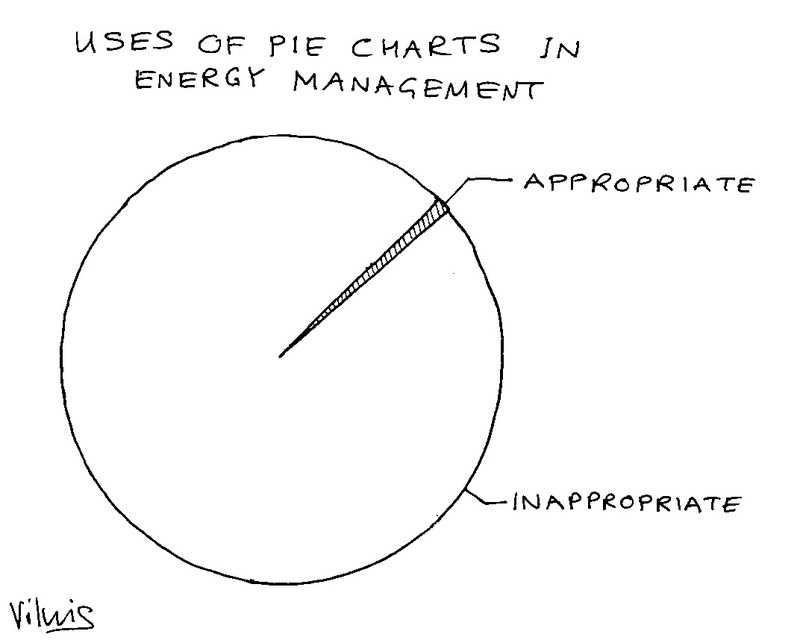 The EnPC is the ratio of actual to expected consumption. By definition this has a value of 1.00 over your baseline period, falling to lower values if energy-saving measures result in consumption less than otherwise expected. To avoid a long explanation of the statistics I’ll also draw on Appendix B of the International Performance Measurement and Verification Protocol (IPMVP, 2012 edition) which can be consulted for deeper explanations. IPMVP recommends evaluation based on the Standard Error, SE, of (in this case) the EnPC. To calculate SE you first calculate the EnPC at regular intervals and measure the Standard Deviation (SD) of the results; then divide SD by the square root of the number of EnPI observations. In my sample data I use 2016 and 2017 as the baseline period, and calculate the EnPC month by month. Let us suppose we want to be 90% confident that the true reduction in the EnPC lies within a certain range. We therefore need to pick a t-value from the “90%” column of the table above. But do we pick the value corresponding to 24 observations (the baseline case) or 5 (the post-improvement period)? To be conservative—as required by IPMVP—we take the lower number, meaning we must in this case use a t value of 2.13. The lowest probable value of the improvement ∆P is thus (0.06 – 0.03) = 0.03 . It may in reality be less, but the chances of that are only 1 in 20 because we are 90% confident that it falls within the stated range and by implication 5% confident that it is above the upper limit. The analysis is based on real data (preview below). These are from an anonymous source and multiplied by a secret factor to disguise their true values. Anybody wishing to verify the analysis can download the anonymous data as a spreadsheet here. Anyone familiar with the principles of monitoring and targeting (M&T) and measurement and verification (M&V) will recognise the overlap between the two. 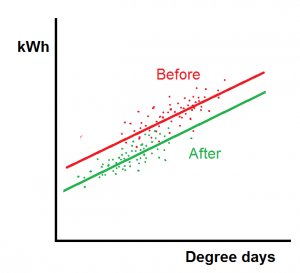 Both involve establishing the mathematical relationship between energy consumption and one or more independently-variable ‘driving factors’, of which one important example would be the weather expressed numerically as heating or cooling degree days. One of my clients deals with a huge chain of retail stores with all-electric services. They are the subject of a rolling refit programme, during which the opportunity is taken to improve energy performance. Individually the savings, although a substantial percentage, are too small in absolute terms to warrant full-blown M&V. Nevertheless he wanted some kind of process to confirm that savings were being achieved and to estimate their value. My associate Dan Curtis and I set up a pilot process dealing in the first instance with a sample of a hundred refitted stores. We used a basic M&T analysis toolkit capable of cusum analysis and regression modelling with two driving factors, plus an overspend league table (all in accordance with Carbon Trust Guide CTG008). Although historical half-hourly data are available we based our primary analysis on weekly intervals. 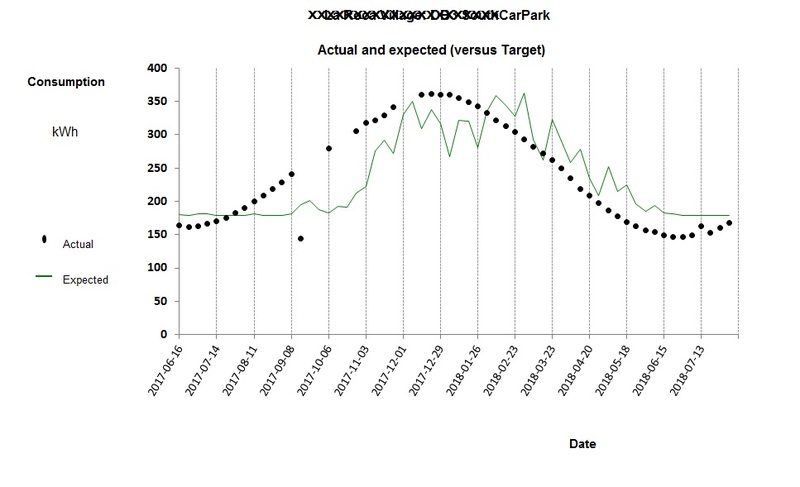 The target model provides a dynamic yardstick for ongoing weekly consumptions. 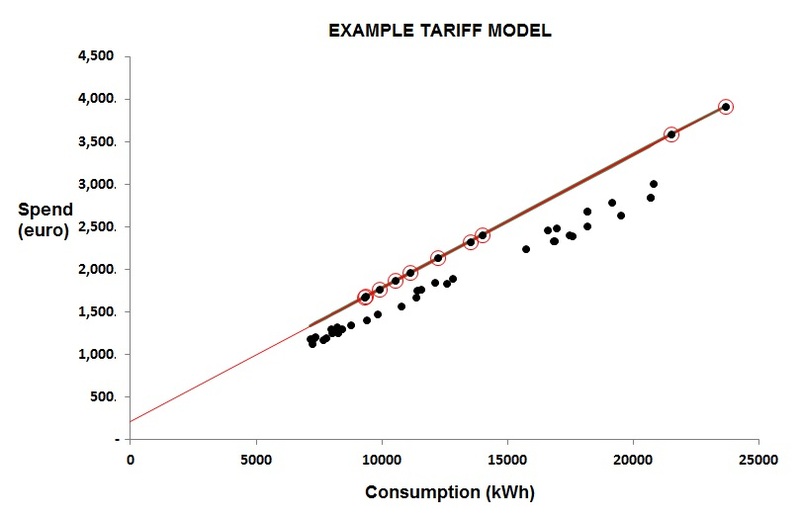 If the energy-saving measures cease to work, actual consumption will exceed what the target model predicts (again given the prevailing degree-day figures). See final section below on routine monitoring. Doing measurement and verification this way is a long way off the requirements in IPMVP. In the circumstances we are talking about – a continuous pipeline of refits managed by dozens of project teams – it would never be feasible to have M&V plans for every intervention,. Among the implications of this is that no account is taken (yet) of static factors. However, the deployment of heat-map visualisations means that certain kinds of change (for example altered opening hours) can be spotted easily, and others will be evident. I would expect that with the sheer volume of projects being monitored, my client will gradually build up a repertoire of common static-factor events and their typical impact. This makes the approach essentially a pragmatic one of judging by results after the event; the antithesis of IPMVP, but much better aligned to real-world operations. 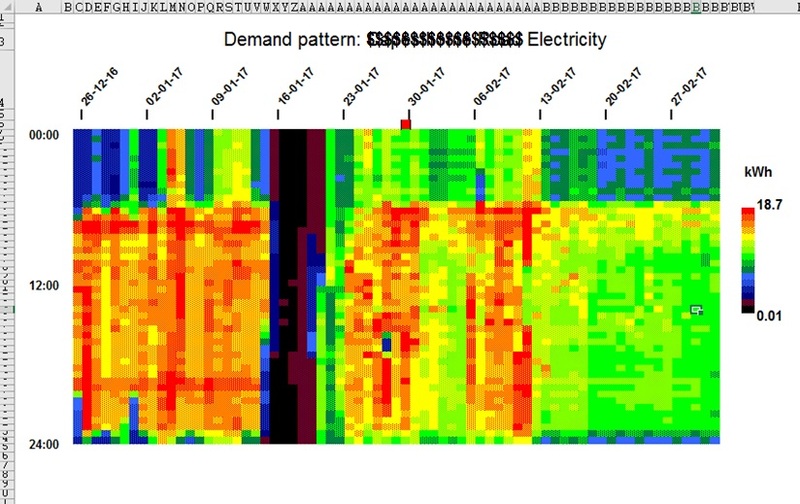 Any important issues are therefore at the top of page 1, and a significance flag is also provided: a yellow dot indicating variation within normal uncertainty bands, and a red dot indicating unusually high deviation. Remedial effort can then be efficiently targeted, and expected-consumption formulae retuned if necessary. 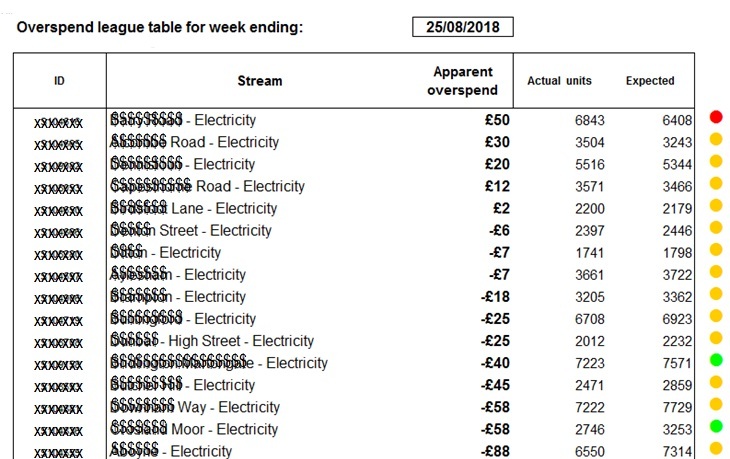 One of my current projects is to help someone with an international estate to forecast their monthly energy consumption and hence develop a monthly budget profile. Their budgetary control will be that much tighter because it has seasonality built in to it in a realistic fashion. I am not claiming this approach would work in all circumstances but it looks like a promising shortcut. 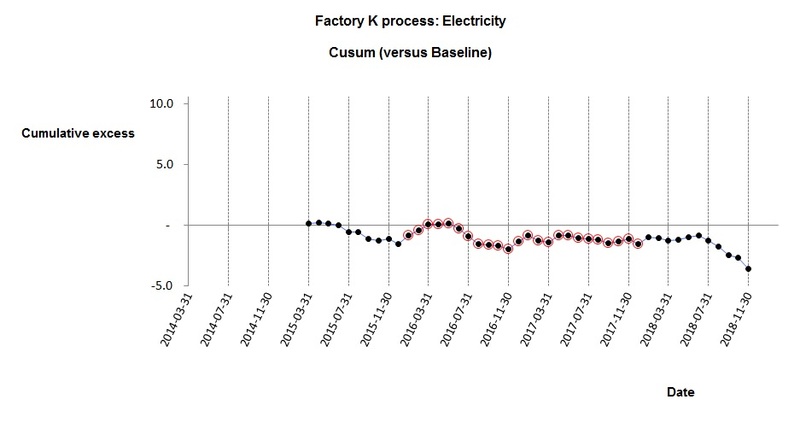 Cusum analysis also had a part to play because it showed if there had been tariff changes, allowing me to limit the analysis to current tariffs only. Furthermore, in one or two instances there were clear anomalies in the past bills where spends exceeded what would have been expected. This suggests it would be possible to include bill-checking in a routine monitoring and targeting scheme without the need for thorough scrutiny of contract tariffs. 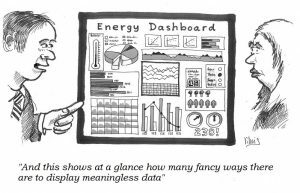 Certification to ISO50001 can yield benefits but would be fatally compromised if a misleading energy performance indicator is used to track progress. 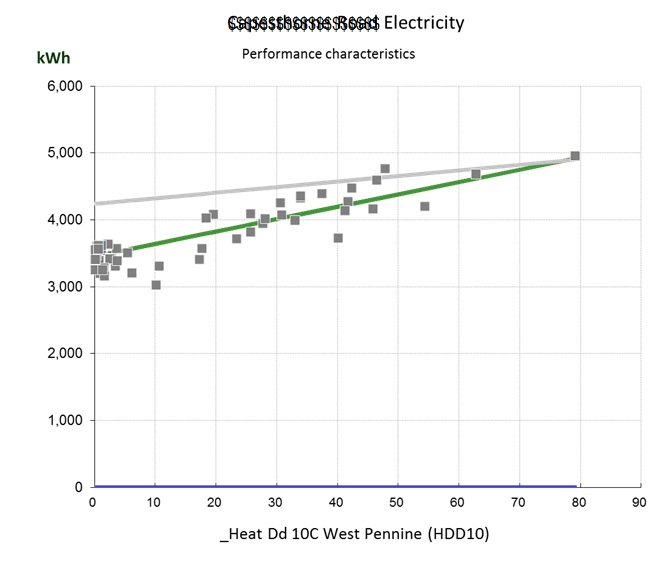 Power Utilisation Effectiveness, PUE, is the data-centre industry’s common way of reporting energy performance, but it does not work. It is distorted by weather conditions and (worse still) gives perverse results if users improve the energy efficiency of the IT equipment housed in a centre through (for example) virtualisation. 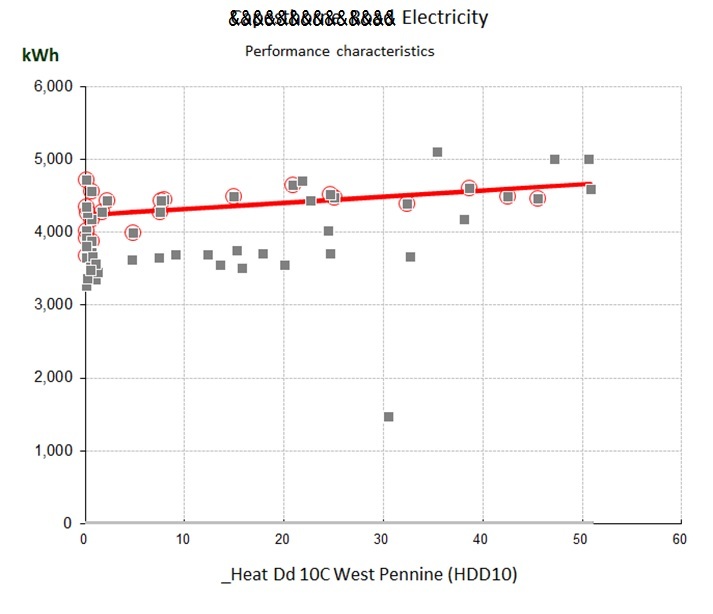 This presentation given at Data Centres North in May 2018 explains the problem and shows how a corrected PUE should be computed. you don’t need to rely on colour coding (meaning colours can be used to emphasise particular items if needed). Pie charts with numerous categories and a colour-coded key can be incredibly difficult to interpret, even for readers with perfect colour perception, and bad luck if you ever have to distribute black-and-white photocopies of them. 1. 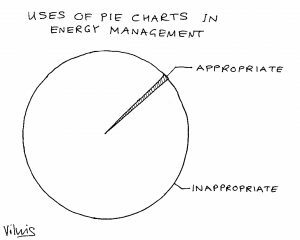 Passive cusum charts: energy M&T software usually includes cusum charting because it is widely recognised as a desirable feature. The majority of products, however, fail to exploit cusum’s potential as a diagnostic aid, and treat it as nothing more than a passive reporting tool. What could you do better? The key thing is to let the user interactively select segments of the cusum history for analysis. This allows them, for example, to pick periods of sustained favourable performance in order to set ‘tough but achievable’ performance targets; or to diagnose behaviour during abnormal periods. Being able to identify the timing, magnitude and nature of an adverse change in performance as part of a desktop analysis is a powerful facility that good M&T software should provide. 2. Dumb exception criteria: if your M&T software flags exceptions based on a global percentage threshold, it is underpowered in two respects. For one thing the cost of a given percentage deviation crucially depends on the size of the underlying consumption and the unit price of the commodity in question. Too many users are seeing a clutter of alerts about what are actually trivial overspends. Secondly, different percentages are appropriate in different cases. Fixed-percentage thresholds are weak because they are arbitrary: set the limit too low, and you clutter your exception reports with alerts which are in reality just normal random variations. Set the threshold too high, and solvable problems slip unchallenged under the radar. The answer is to set a separate threshold individually for each consumption stream. It sounds like a lot of work, but it isn’t; it should be be easy to build the required statistical analysis into the software. 3. 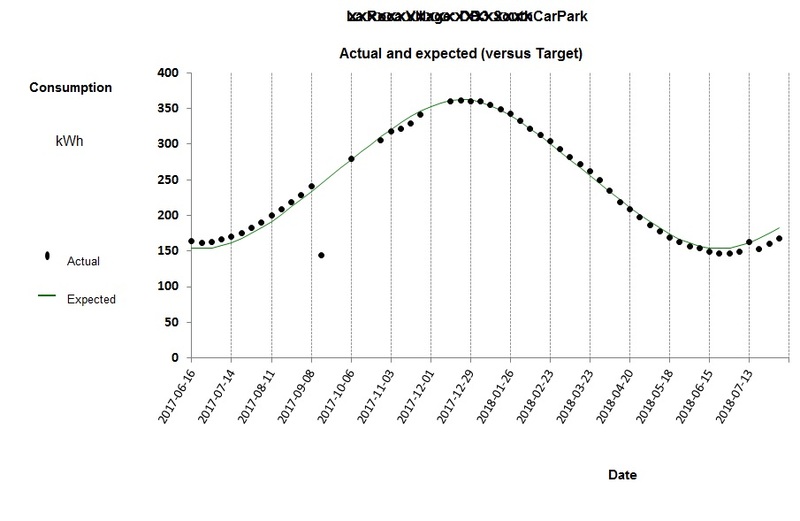 Precedent-based targets: just comparing current consumption with past periods is a weak method. Not only is it based on the false premise that prevailing conditions will have been the same; if the users happens to suffer an incident that wastes energy, it creates a licence to do the same a year later. 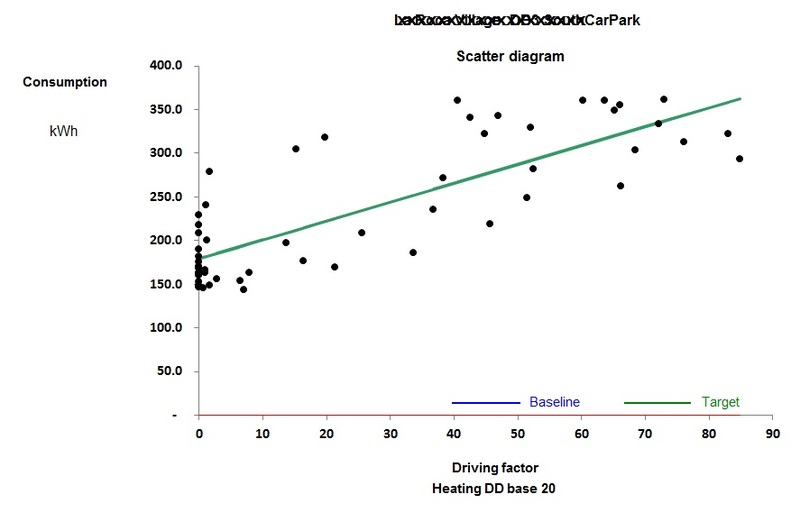 There are fundamentally better ways to compute comparison values, based on known relationships between consumption and relevant driving factors. 4. Showing you everything: sometimes the reporting philosophy seems to be “we’ve collected all this data so we’d better prove it”, and the software makes no attempt to filter or prioritise the information it handles. A few simple rules are worth following. Only in significant and exceptional cases should it be necessary to examine detailed records. 5. Bells and whistles: presumably in order to give salesmen something to wow prospective customers, M&T software commonly employs gratuitous animation, 3-D effects, superfluous colour and tricksy elements like speedometer dials. Ridiculously cluttered ‘dashboards’ are the order of the day. 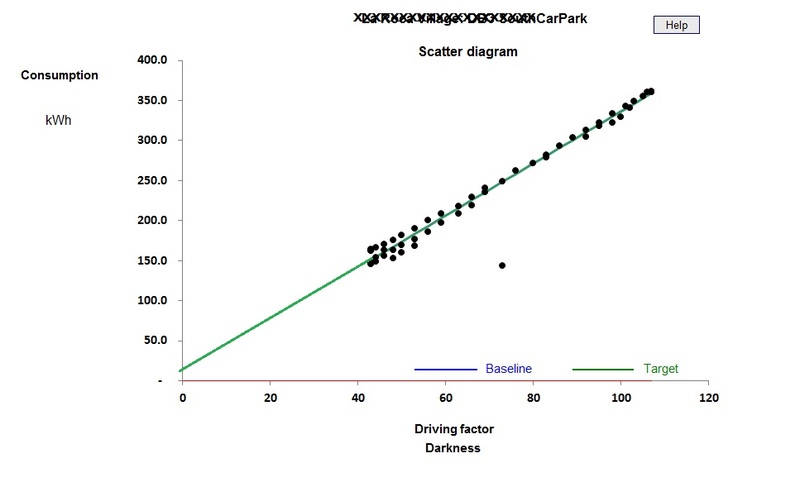 In classic monitoring and targeting practice, consumption is logged at regular intervals along with relevant associated driving factors and a formula is derived which computes expected consumption from those factors. 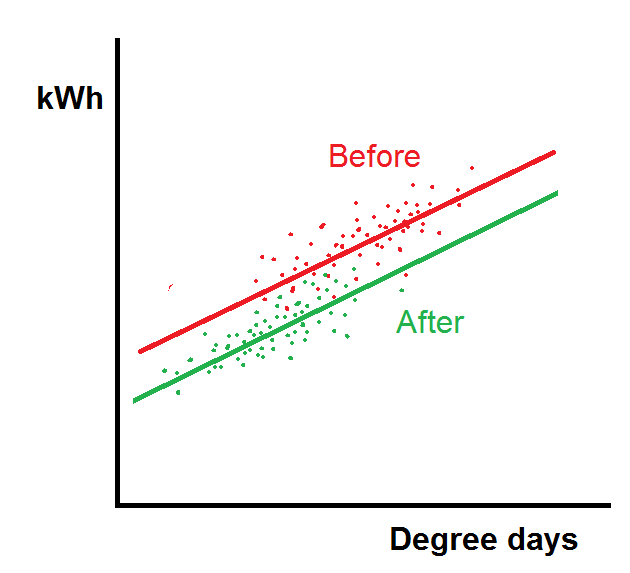 A common example would be expected fuel consumption for space heating, calculated from measured local degree-day values via a simple straight-line relationship whereby expected consumption equals a certain fixed amount per week plus so many kWh per degree-day. Using this simple mathematical model, weekly actual consumptions can then be judged against expected values to reveal divergence from efficient operation regardless of weather variations. The same principle applies in energy-intensive manufacturing, external lighting, air compressors, vehicles and any other situation where variation in consumption is driven by variation in one or more independently measurable factors. The expected-consumption models may be simple or complex. Comparing actual and expected consumptions through time gives us valuable graphical views such as control charts and cusum charts. These of course rely on the data being sequential, i.e., in the correct chronological sequence, but they do not necessarily need the data to be consecutive. That is to say, it is permissible to have gaps, for instance to skip invalid or missing measurements. “Brigadoon” is a 1940s Broadway musical about a mythical Highland village that appears in the real world for only one day a year (although as far as its inhabitants are concerned time is continuous) and its plot concerns two tourists who happen upon this remote spot on the day that the village is there. The story came to mind some years ago when I was struggling to deal with energy monitoring of student residences. 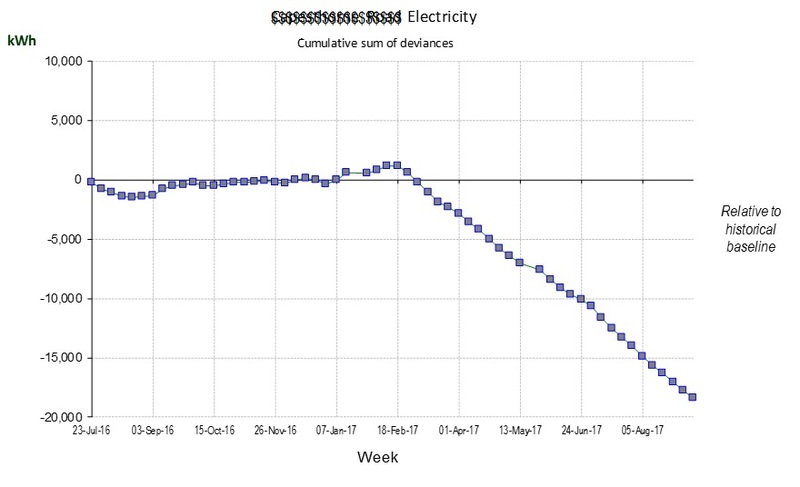 Weekly fuel consumption naturally dropped during vacations (or should do) and I realised I would need two different expected-consumption models, one for occupied weeks and another for unoccupied weeks using degree-days computed to a lower base temperature. 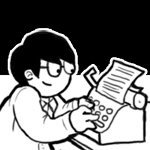 One way to accommodate this was to have a single more complex model that took the term/vacation state into account. In the event I opted for splitting the data history into two: one for term weeks, and the other for vacation weeks. Each history thus had very long gaps in it, but there is no objection to closing up the gaps so that in effect the last week of each term is immediately followed by the first week of the next and likewise for vacations. This strategy made the single building into two different ones. Somewhat like Brigadoon, the ‘vacant’ manifestation of the building for instance only comes into existence outside term time, but it appears to have a continuous history. The diagram below shows the control chart using a single degree-day model on the left, as per conventional practice, while on the right we see the separate control charts for the two virtual buildings, plotted with the same limits to show the reduction in modelling error. This principle can be used in many situations. I have used it very successfully on distillation columns in a chemical works to eliminate non-steady-state operation. I recommended it for a dairy processing plant with automatic meter reading where the night shift only does cleaning while the day shift does production: the meters can be read at shift change to give separate ‘active’ and ‘cleaning’ histories for every week. A friend recently asked me to look at data collected from a number of kilns with batch firing times extending over days, processing different products; here it will be possible to split the histories by firing programme: one history for programme 20, another for 13, and so on.